We prepare all our food from fresh ingredients and, where possible, source our ingredients from local suppliers and producers. Your breakfast will be freshly cooked while you enjoy a cafeteria of coffee or a pot of tea and range of cold dishes from our breakfast counter and a leisurely read of the morning paper or a magazine. In addition to the menu we also offer daily specials and are happy to cater for any dietary requirements. 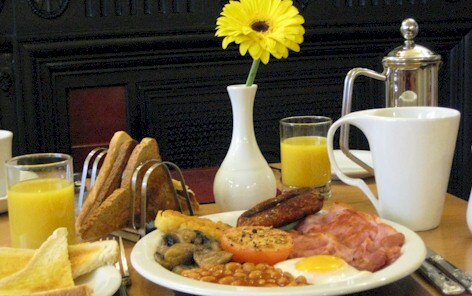 Free range eggs, Bacon, butchers sausages, black pudding, fresh vine tomato & mushrooms, hash brown and baked beans. A full vegetarian breakfast is always available. We have a variety of lighter options including scrambled eggs, bacon sandwich or good old beans on toast. Plus we offer a daily Arches special. 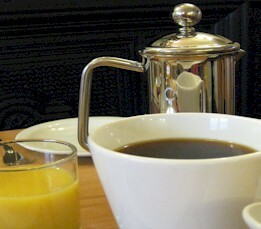 To finish you can have unlimited white or brown toast served with Laura's homemade marmalade and preserves.